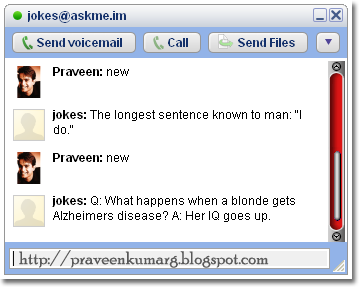 Add jokes@askme.im to your friends list in Gtalk. Type new and Hit enter. You can get latest jokes each time you type new and hit enter. Add url@askme.im to your Contact. Just type the URL you need to shorten in chat box. By using this you can translate from any language to the language you want. 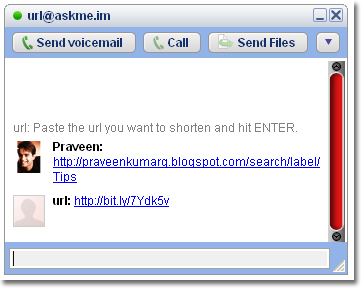 To use , add en2hi.translit@bot.talk.google.com it to your Friends list. Type the text hit Enter you can see the message you want is transliterated. Add these email id’s to your gtalk and type help for more info or check the Bot’s status message. googlesms@bot.im – the ultimate bot for all your basic needs like cricket scores, railway info, find businesses around you, stock quotes, horoscope and more, Click here to know more about this bot. imified@imified.com – Personal Manager to store notes, and also synchronize and post to different websites like twitter, blogger etc. webaroosms@gmail.com – Send SMS to your smsgupshup.com group members from Gtalk. First sign-up for SMSgupshup and create an SMS group. Integrate your Gtalk account and add webaroosms@gmail.com as a Gtalk buddy. Now, you can send message to this SMS group right from your gtalk.